A horse's back naturally slopes down slightly behind the withers and raises slightly at the hips. However, a horse with good conformation should have a fairly flat top line. A dipped back is one common back problems horses face. This condition is easily recognizable by the extreme dip between the horse's withers and hips. A dipped back or swayback in a horse technically is referred to as lordosis. This condition sometimes develops in young horses, but often appears and gets worse as your horse ages. In a horse with a healthy spine, the vertebrae are straight. The natural slopes in the back are created by the spinal processes and back muscles. Lordosis occurs when the spine sags rather than remaining straightly aligned. A dipped back often occurs in older horses when the back muscles, ligaments and other soft tissues responsible for holding the vertebrae in alignment weaken, allowing the spine to sag. When lordosis appears in younger horses, it often is caused by deformed vertebrae that prevent the spine from aligning correctly. Horses with long backs or high head carriage are more likely to suffer a dipped back. In many cases, lordosis does not cause pain or other health problems in horses. Horses have a strong and rigid spine that protects the horse from developing neurological problems, such as pinched nerves, from a dipped back. While they may have slightly altered gaits and less flexibility, a dipped back usually does not limit the horse's performance. One challenge you will face if you want to ride a dipped back horse is fitting a saddle correctly. A poorly fitted saddle may cause your weight to be unevenly distributed on the horse's back resulting in pain or lameness. Use a saddle pad that contours to the horse's back and helps to fill in the dip so that the saddle fits better. Use a light saddle if possible to decrease weight you put on your horse's back. Exercise is important to keep the muscles that support the spine strong and to prevent a dipped back from getting worse. 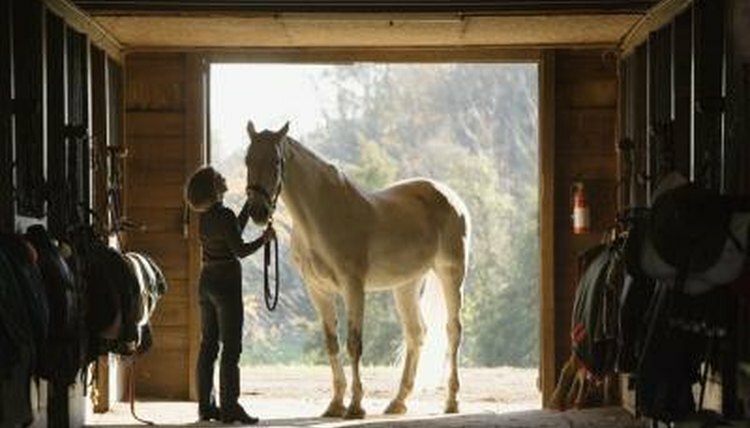 Exercise the horse by riding or working with him on the ground. Encourage your horse to keep a rounded frame and consider using ground poles or side reins to help with this. In addition, manage your horse's diet to maintain correct weight.